Laughing Dog Brewery is located in Ponderay, Idaho, and have been brewing beer since 2005. 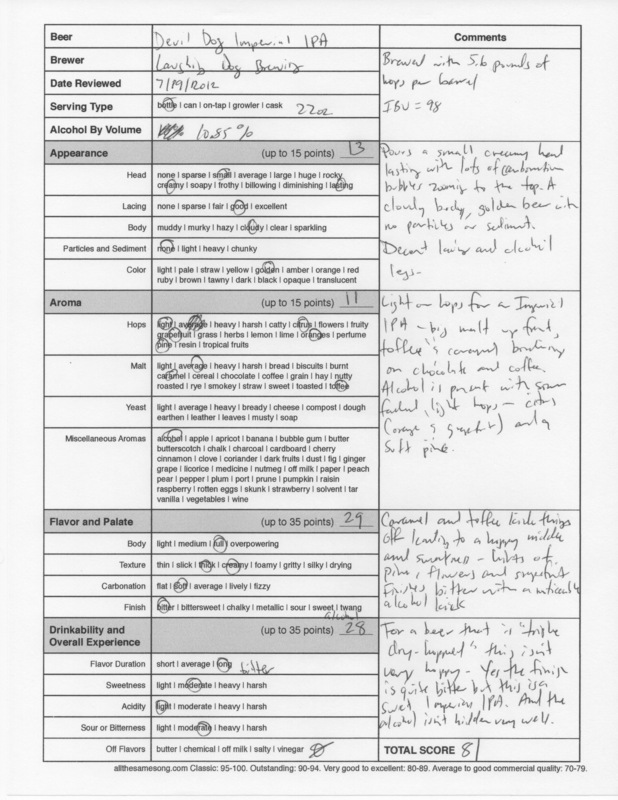 Several months ago, I reviewed their Sneaky Pete Imperial IPA, a beer that they brew exclusively for the bottle shop Total Wine, and gave it 95 points. It was a great beer that was unique in the fact that it had a Tootsie Roll flavor, while still maintaining great tropical fruit hop notes. I gave Sneaky Pete 95 points. 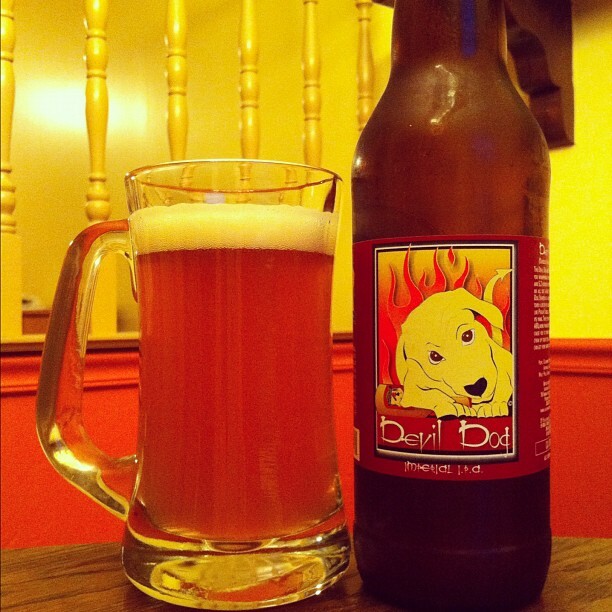 Laughing Dog jokingly says that the dog featured on all of their bottles, a yellow Lab named Ben, runs the brewery. But his owners, Fred Colby and Michelle Douglass actually run the show. The company has a full line of year-round and seasonal beers, and the beer I am reviewing from them today comes from their “Reserves” series, and is another Imperial India Pale Ale. Devil Dog Imperial IPA is brewed with 5.6 pounds of hops per barrel, and the brewery says “the Devil Dog will chew you up and leave you whimpering for more.” This beer comes in at 98 IBUs (International Bitterness Units) and is hopped with Columbus, Northern Brewer, Ahtanum, Cascade, and Simcoe. The beer is triple dry-hopped, and the malt bill features Pale, Caramel, and Munich. Devil Dog Imperial poured a small, creamy head that lasted throughout the duration of drinking. Loads of carbonation bubbles zoomed to the top of the drink, which was golden in color and had a cloudy body, but did not contain any particles or sediment. As it warmed, the beer became almost completely clear, indicating a chill haze. The lacing left behind was of good quality and the alcohol legs on this big 10.85% ABV (alcohol by volume) beer were very nice. On the palate, the caramel and toffee really show, kicking things off with a sweet experience, which leads to a hoppy middle with hints of pine, flowers, and grapefruit that collide with the sweet start. The finish lends a fair amount of bitterness and has a big alcohol kick that warms the entire body. The bitterness turns medicinal at the very end. For a beer that is “triple dry-hopped,” this just isn’t very hoppy. Yes, the finish is pretty bitter, but it’s more of that medicinal-type bitter, like crushed aspirin. 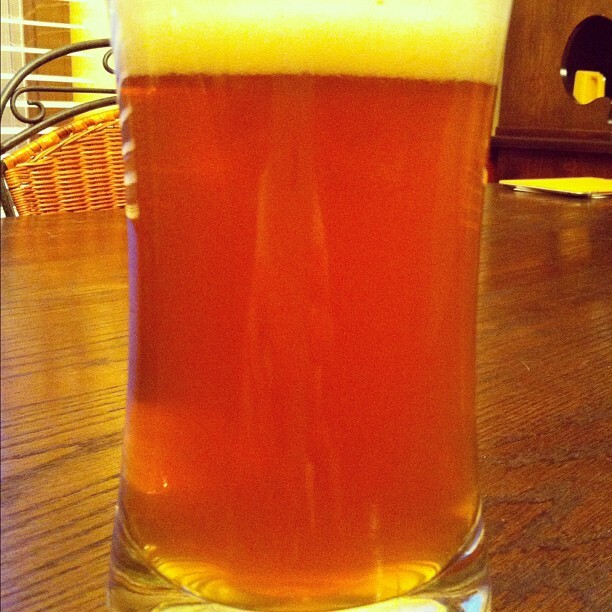 Those wonderful hop flavors never present themselves, and this is more on the sweet end than the hophead territory. Let’s just say I wasn’t chewed up and whimpering for more. It’s a decent beer, but not what I expected. 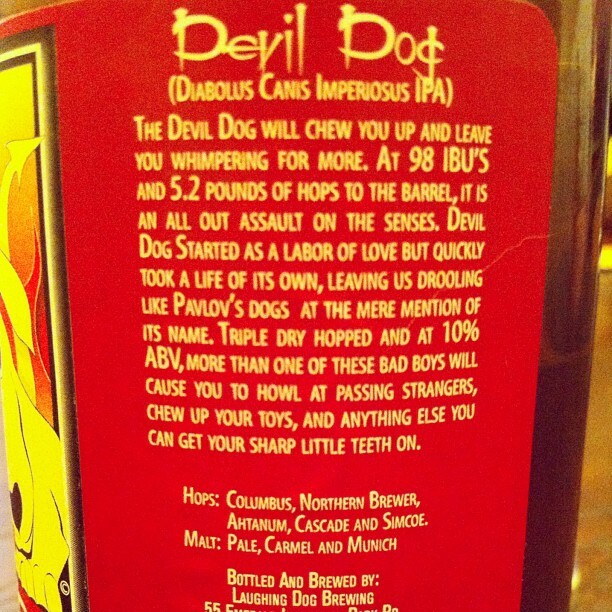 Laughing Dog Devil Dog Imperial IPA, 81 points. Price: $6.99 US for one 22 oz. bomber size bottle.